In the Preface, the author writes, “…The target audience for this book is anyone who requires an intimate and detailed knowledge of planetary rovers and how they are likely to evolve in their capabilities in the near future.” And this is exactly what the book delivers; an awesome breadth and depth of knowledge into a technology that enables human exploration of other planets. The reader is introduced to the role of Macro-Rovers (>100 kg), Mini-Rovers (50 – 100 kg), Micro-Rovers (10 – 50 kg) and tethered Nano-Rovers all of which need to operate in extreme or hostile environments over challenging terrain. There is a concise section that covers project management and would benefit early career space scientists / engineers and seasoned PM’s alike. Chapter 2 addresses the planetary environment and really brings out the design challenges presented to mission designers by an unknown and hostile terrain (rocks, cliffs, crevasses etc). The author discusses chemical / physical properties of the Moon and Mars along with the main science goals that have driven their exploration to date. Students reading degrees and course modules in space or planetary science might want to have look at this text, with its many references. There is nothing like a little space history to focus the reader on how far we have come in exploring the planets with their extra-terrestrial rocky surfaces and thereby provide some perspective about how much we still don’t know and hence, how far we have to go. Chapter 3 goes on to give an informed precis of past rover missions. Now we get to the ‘meat and potatoes’ of this book staring with rover mobility and locomotion in chapter 4. Locomotion metrics, tracks or wheels and getting over or around obstacles? How will the wheels interact with the soil? And are the wheels big enough not to sink for a particular regolith type? These are all basic questions when designing a mission and the author introduces the reader to the fact that seemingly simple issues can actually be quite tricky to address. If you are a student of mechanical engineering, there are some wonderfully worked examples of how to get the “simple” things right! Having a set of wheels, or tracks for that matter, is one thing, but driving them takes us in to the area of electrical and software engineering. I personally have experience of using high reliability ‘space’ motors and wish there had been a book around with this very detailed and informative section. The author discusses in detail how to select and use different motor types. Chapter 5 takes the reader through such subject areas as stall currents, torque, motor gear interfaces and gear ratios, right through to the algorithms implemented by the electronic controllers that drive these motors. Planetary rovers require control systems and if you thought that it was only your car that had traction control then think again! Sensory fusion is the process of bringing data from multiple sensory modalities to safely traverse the challenging and often changing or unknown characteristics of the terrain. No single modality sensor can provide sufficient data to extract all the relevant features of the environment, but vision tends to be the most information rich. Rover vision is the subject of chapters 6 and 7, starting the reader with 3 key roles of cameras; i) navigation, ii) deployment positioning of distal devices on a robotic manipulator and iii) general scientific observation. Vision is fundamental to rover missions and the author discusses this critical area of rover design with examples of actual imaging systems that have been used or are planned to be used on future missions. Chapter 6 covers; camera and sensor selection, vision processing, terrain imaging and stereo vision. In chapter 7 the reader is treated to in depth discussions of advanced vision technologies including, visual odometry, optic flow – based navigation and active vision. In chapter 8 through 10 we read about automatic navigation, tele-robotics, behaviour based autonomy and intelligent rover architectures, digital elevation models and a detailed discussion of how the NASA MER twin rovers actually navigated the surface of Mars. Exploration of a planet also extends into the sub-surface or getting inside a rock, for example. Chapter 11 covers the subject matter of “Robotic Sample Acquisition”. This is ultimately why we send rovers to other planets, to pick up a rock and see what is underneath or to look inside something that has not seen the light of day in billions of years; is there evidence of previous life? I have reviewed a previous book called “Drilling in Extreme Environments”, but the author here really takes this further and considers the subject from the point of view of the rover and how a rover articulates a geo-technics or sample acquisition tool. Of course, exploration must now consider not just roving a planetary surface but in the future, plunging the depths of an ocean under the ice of Europa or Enceladus. This is the discussion in chapter 13 where the author reports on case studies, concept mission designs and the sub-surface analogs such as Lake Vostok, beneath the ice sheet of East Antarctica. The book concludes with chapter 14 that looks at future concepts and considers more exotic technologies that enable robotic walking, crawling hopping and non-contact locomotion like balloons. The author opens at the beginning with the basic question, in section 1.1; “Why Rovers”. And just like a planetary rover exploring a new terrain, the author takes the reader on a journey through an engineering landscape rich in references (1551 to be exact! ), worked examples (including basic algorithms) and insight in to what I consider to be an exciting area of space engineering. 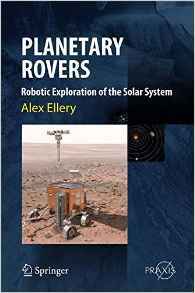 He illuminates some of the ‘pitfalls’ of rover missions and provides an authoritative and in depth, single point reference that will be invaluable to anyone involved with such missions; scientist and space agencies organising field trials, students and teachers alike as well as the general reader that has an interest in space engineering and planetary exploration.